Published: Oct. 7, 2013 at 02:46 p.m. 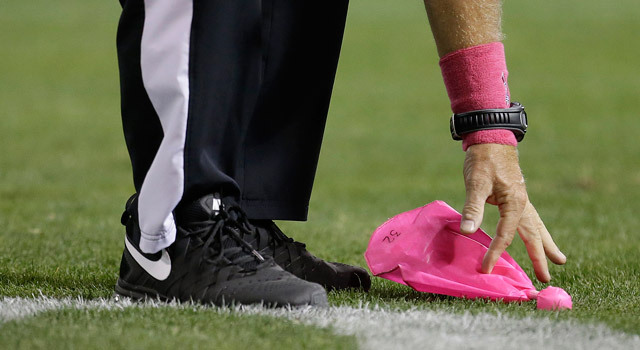 Updated: Oct. 7, 2013 at 05:05 p.m.
Say so long to the NFL's pink penalty flags. NFL spokesman Michael Signora confirmed to NFL Media on Monday that the flags -- used to promote the NFL's breast cancer awareness initiative -- no longer will be used after Week 5. Other pink equipment will remain part of the NFL landscape through Week 7. 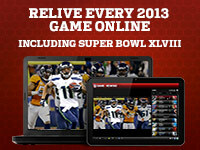 That includes: cleats, wristbands, gloves, sideline hats, helmet decals, captains' patches, chin cups, shoe laces, skull caps, sideline towels, eye shield decals and quarterback towels. That's a lot of pink on the field, which made for some minor confusion during game telecasts on Sunday. Confusion is bad. Clarity is good. Long live yellow.